It has been quite some time since I have posted to my blog. I apologize for the absence! There was a glitch that has (finally) been cleared up. (I hope). Anyway, thought I would digress from the serious work for a bit and show a 7 foot business sign that I was hired to make some years ago (lots of years ago). The folks at Moresca Clothing and Costume, one of the largest Renaissance costume shops in the country, found me on the (then) new "web" and decided I was the studio where they wanted their new sculpted sign to be made. I was given a Middle Ages wooden sculpture, a picture of one, I mean, and told that it was their logo. What follows was the process. I first built a plywood wall that would be totally flat, and then added Roma Plastilina clay. I used the tools they sculpt cars out of, large flat blades, to shape the flat sections. Bottom left shows "butterflies" we use to help the newly applied clay to stay up. This is an 18th century technique. As I went on the man looked more and more like my cousin, Jack. I made the thumb and the foot protrude beyond the circle to add interest. The final piece was molded in the studio, which was quite a trial, because it was 7 feet in any direction and I had to basically suspend myself over the work, which had been placed horizontally to hold the rubber and plaster portions of the mold! And here I am using screws to hold the large letters on to the sign. Mold was cast at Empire Fiberglass in little Falls, NY by my friend Neil Baum. Fiberglass cast was painted with acrylic car enamel and installed at Moresca, just outside of Rhinebeck, NY. My good friend and genius engineer Jim Mouton had followed me home one day some years ago. That is what happens when your name is plastered over the side of your truck. He had wanted to meet me, had heard of me through friends in Porter Corners, where we both lived. I think I told how Jim designed the Crucifix armature to have a plate bolted to the studio floor with a steel tube welded to it. A slightly smaller steel tube fit into this and the armature super structure was welded to this. The actual figure skeleton was a separate part that fit into three locations on the structure- two hands and one foot. This allowed disassembly when the time came to mold the front AND back of the piece. 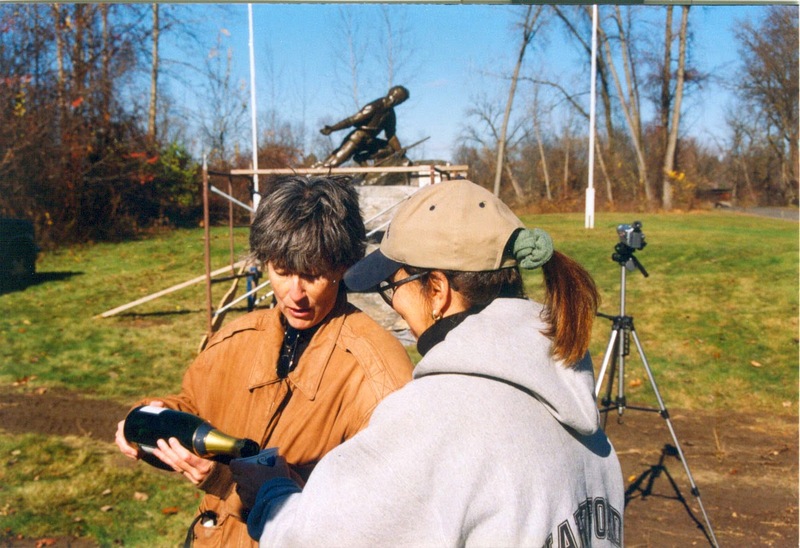 When the sculpting was finished, the committee from New Jersey was invited to come and see the piece in order to approve before mold making and casting. This group of people was wonderful to work with. With the help of friends I winched the armature with clay attached up into the studio staircase in order to achieve the 14 foot height we would have. When the committee arrived the sun came into the studio and it was an incredible sight. With minor changes it was decided to move ahead. All molding and casting were done right here, and I had complete control over the finished piece. 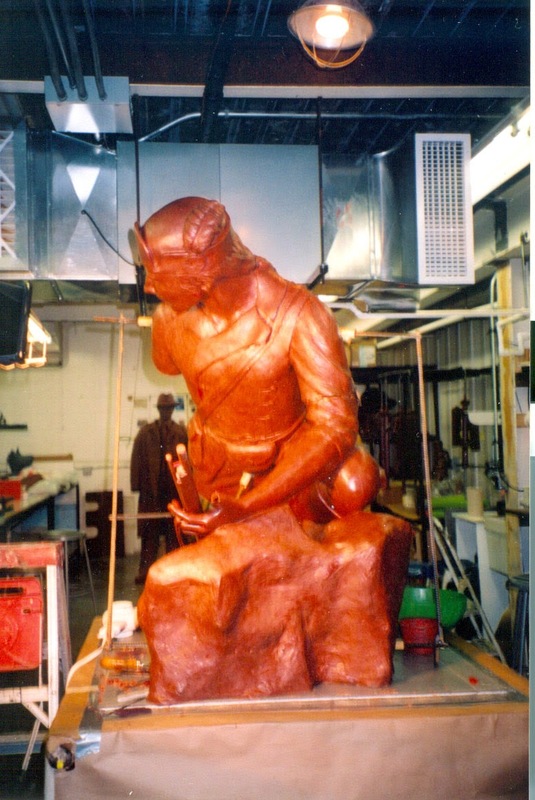 Bonded bronze was the material chosen, so it was a matter of painting the resin and bronze powder mixture into the mold. This is of course more involved, with not only fiberglass in the layers, but steel tubing from hand to hand to facilitate strength. 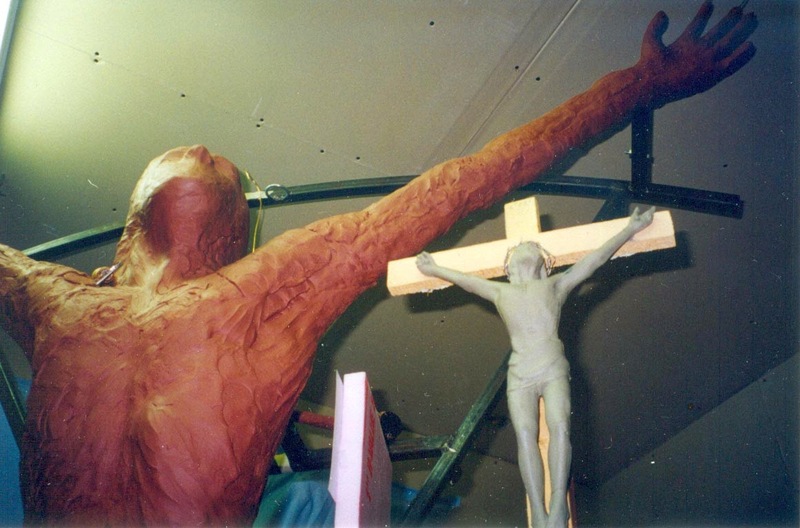 Tico Vogt made the crucifix itself. They wanted a hand hewn look, and this is what we did. Tico was great to work with, and he got some stares on the road from his shop to my place. 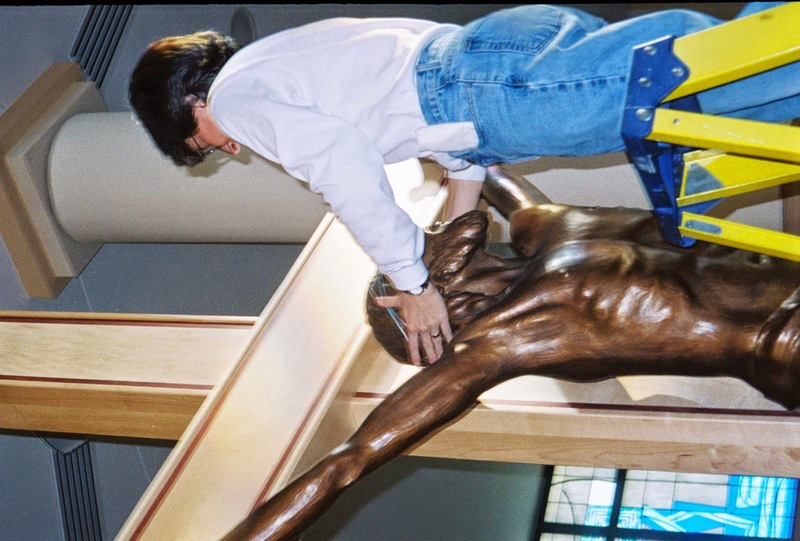 The Crucifix was designed to be moved around the church to a number of locations, and the figure itself is removed for the Easter season. 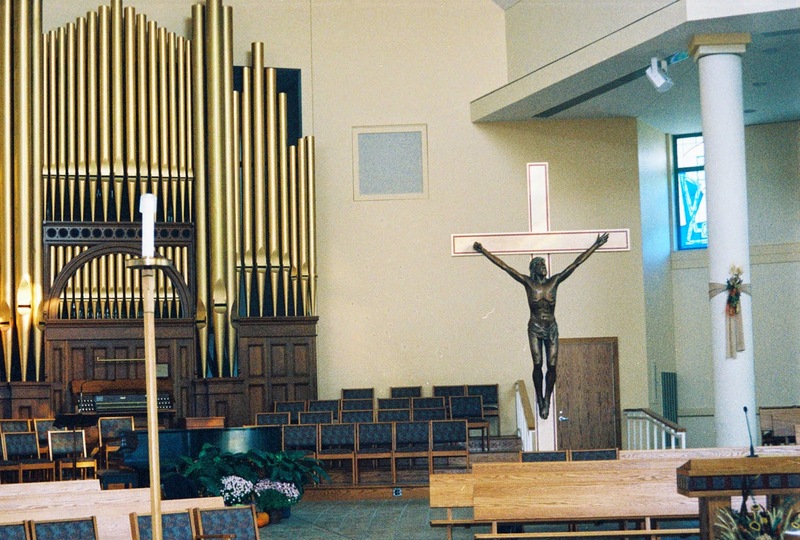 I worked with the architects to install stainless steel tubes in the floor which were just slightly large than the tube we installed in the cross. This project was one of the most fascinating and rewarding things I have ever done. 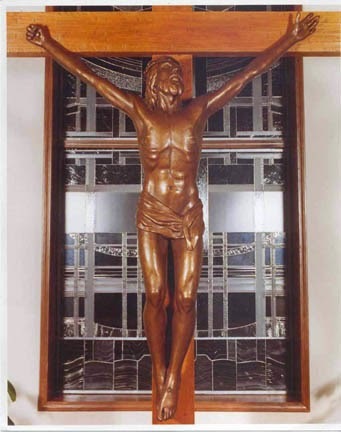 As I think I have said, another copy of the crucifix was purchased by St. John the Evangelist Church in West Chester Ohio. This time a local shop, friends I had met at a conference, built the amazing cross. Maple with purple heart wood inlaid as an outline of the cross shape. The edition was planned to be six copies, but the mold failed after only three. The #3 in the edition is here now waiting for a home. There will not be any additional copies. More very soon. I may put off the Mary and Joseph posts to get in some sculpture (well, art) news. Please stay tuned! 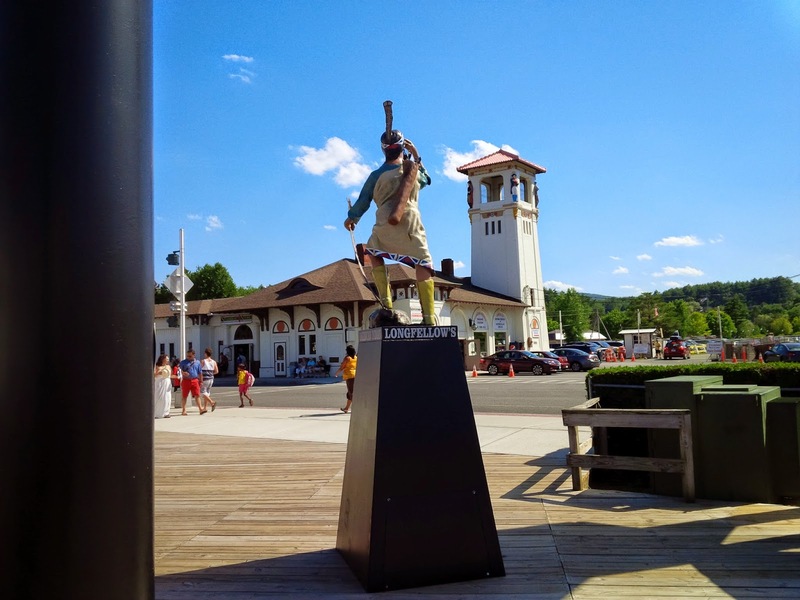 I just became aware of the fact that an artist had created a statue of Lucille Ball for her hometown of Celeron, NY. It has been an eyesore and a bone of contention ever since, a number of years now. People have taken sides and the opposition has a blog called "We love LUCY". #1 A design should be presented in scale model form for the individual or group to examine. This is normally done with the help of a Design Contract. Simply an agreement that lays out what the artist will do and what the client will pay. When the models, (and I say models, I provide three) are presented you will know whether the sculptor has in mind what you had in mind. You cannot assume that a sculptor can work in large scale unless they have a portfolio of large work. #2 If the client is pleased with a design, it is time to enter into a Fabrication Contract. The sculptor outlines what he will create in terms of design, materials, scale, medium, deadline and price. Payments are made as the work progresses. THIS NEXT STEP IS IMPORTANT. 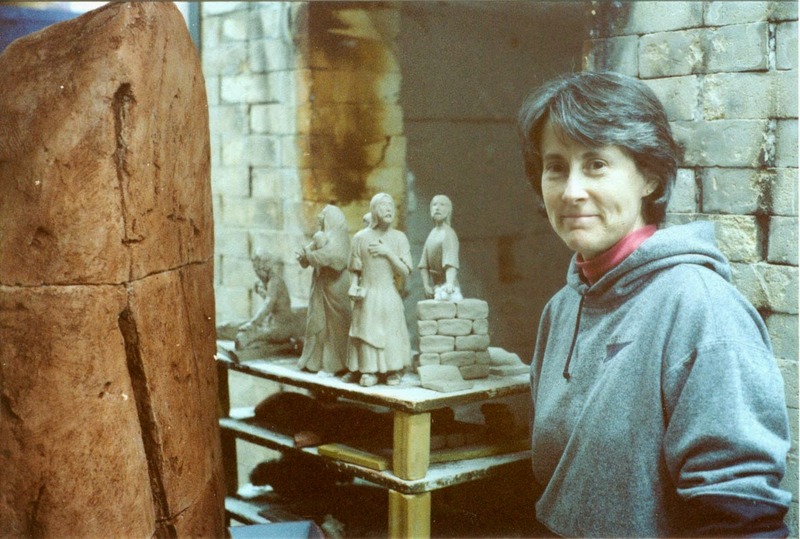 The client is called in to examine and approve of the original clay sculpture. In this way, a piece would never be molded and cast (which costs in the tens of thousands of dollars) in the event that it is not acceptable to the client. 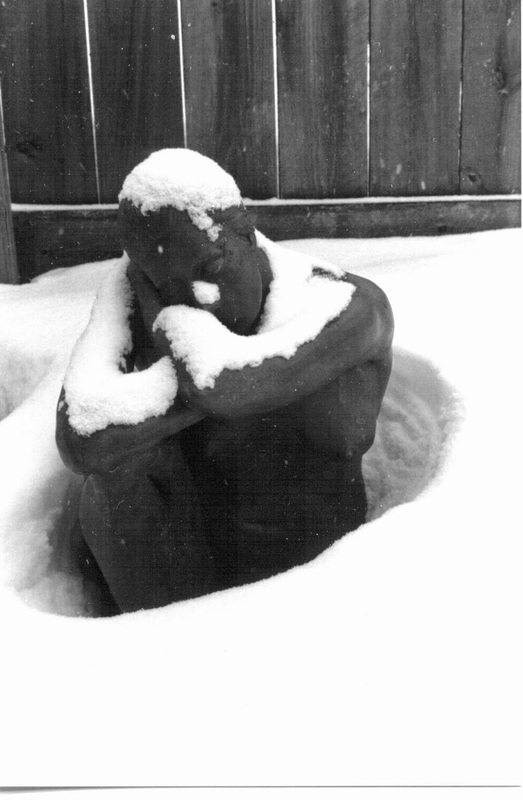 What you should see when the sculpture arrives is a bronze version of what was approved in the clay. A final payment is always held back until delivery. Satisfaction is guaranteed. I have heard numerous scary stories over the years from people who have commissioned artwork in the form of stained glass, paintings and sculpture which fell short of what the client imagined. This gives all artists a black eye. In my view it is criminal to sell someone something sight unseen and expect payment. In this case "Scary Lucy" is the most egregious. This wonderful woman was absolutely gorgeous, and I refuse to re-print the picture of the sculpture I saw online. I was pleased to learn that the City has secured another sculptor who will "repair the piece". 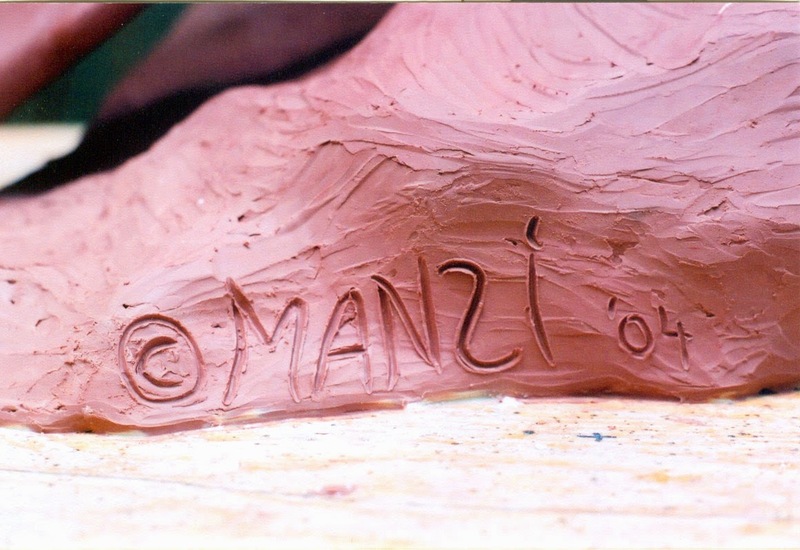 I offered Manzi Studios' services, but was too late in my contact with them. Good luck to Celeron. An inordinate amount of time has passed since the Crucifix post #1. 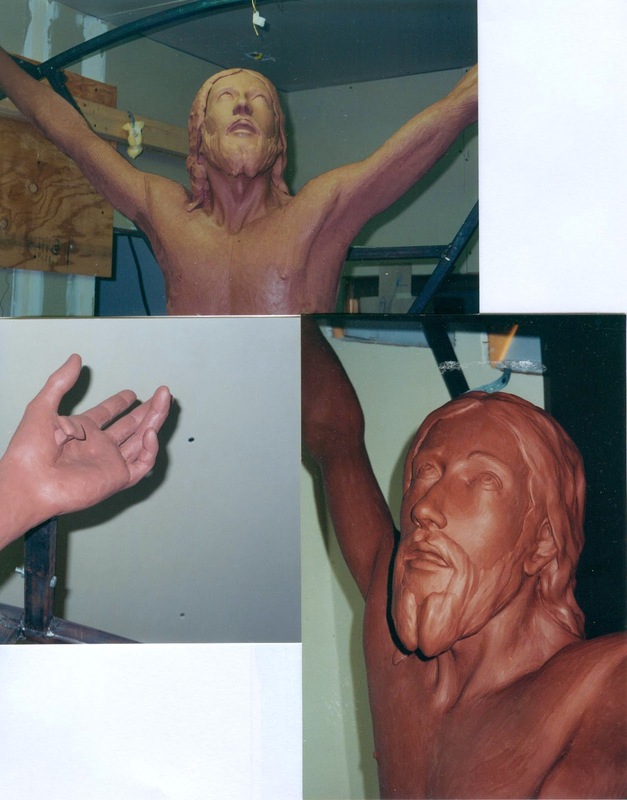 To summarize, I was chosen from a field of 27 sculptors from the East Coast to create three sculptures for St. Joseph's Church in Millstone, NJ. My good friend Jim Lewis of Icarus Furniture in Troy had put me in touch with the committee when he heard of the commission. I thank Jim so much for this, as it changed my life. Also for this help and hands on assistance when I needed him over the years. Thank you, Jim! When I attended the first committee meeting in Millstone I expected to be asked to design and create a St. Joseph statue. I had with me a slide show of my Goddess figures in stoneware, as these (and a few small works from childhood and college) were my only religious pieces prior to that time. The committee was a wonderful group of dedicated people led by Balbina Faini. Halfway into the meeting I was taken aside and asked whether I would have an interest in creating also a life sized crucifix figure. I was not prepared for this, but felt very fortunate to have been asked, and that must have showed. The committee chose one of the three models, or maquettes that I made, and I was able to explain my choices for pose and expression based on the Zugibe research. I shared everything I had found with them. My good friend Jim Moulton agreed to design an armature for the figure so that I could not only work from all sides, but turn the piece effortlessly on its base. 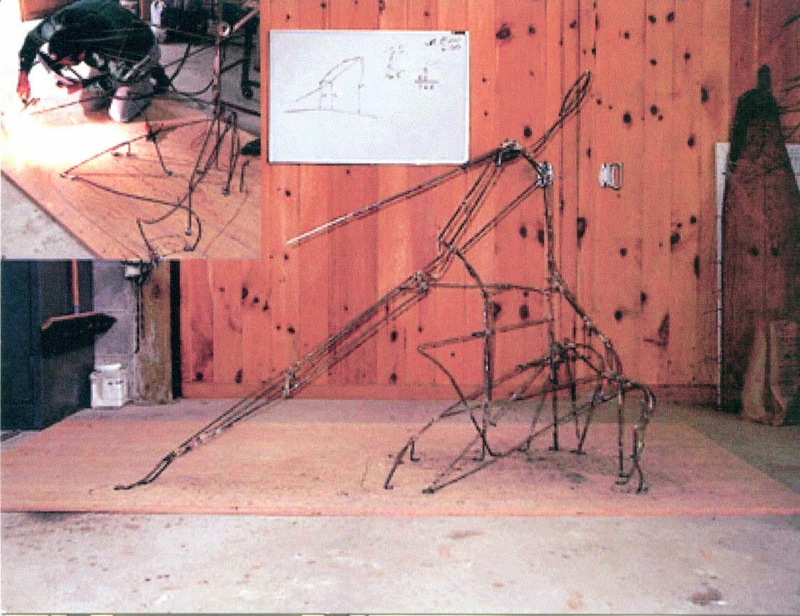 We formed and welded the armature at his studio in Porter Corners. The frame allowed the figure itself to be removed when it was time for mold making and casting. It all worked just as planned. on the right of the armature picture. Here I have been applying clay. One of the best parts of a project. Christ, who 'sat at the right hand of God", would be looking up at him in his last moment of life. With his right hand he would be holding onto precious life (the clenched fist). With his left he would be reaching for his Father, for his destiny. He asks "Why hast thou forsaken me?" And so he is speaking at the moment of death. My design differs from many that have been made over the millennia since the event in that Christ is alive, and not portrayed with his head slumped forward in death. The nails, which would have been hand made and used on an important figure, are placed exactly as Dr. Zugibe has proven they must have been to hold a fully grown man. There is only one location where this is possible. Most people, still today, believe the Barbet research from the 1940's. I have found it very difficult to change any minds over this issue. I retain all the images, experiments and etc. that Dr. Zugibe sent me, which served as the basis for my design. A very happy camper after being chosen to design and create not only the St. Joseph in life size, but a Mary with the Infant as well. Loading "Papa" kiln at Skidmore College. See Mary and two Joseph models. They chose the one on the right so we could have Joseph the Carpenter at his workbench. Replaced stone bench with one made of wood. The large piece in this kiln? Of course, by Tom Schottman. More coming soon. The remainder of the crucifix project and the Mary and Joseph figures in progress, built hollow in stoneware and fired (! ), all at Skidmore. Hello to all who have been following my new blog. I hope you might scroll down to see previous posts as well. I am skipping all over the place in terms of time...placing posts as I find new and some very old images. 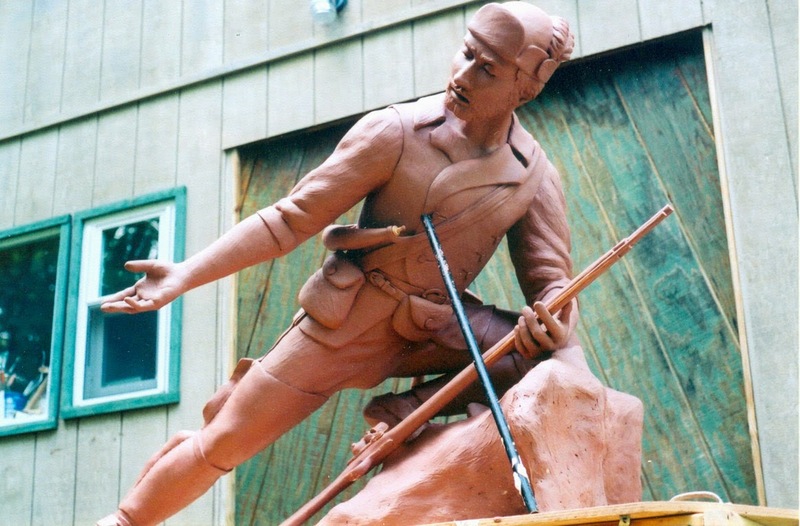 Posting about new (last summer, Minne Ha Ha Statue for Lake George) and old sculpture, and the processes that went into creating them. My focus is to give some behind the scenes views into the life of a sculptor. What is required BEFORE the actual work begins. Also, what goes on during and after. 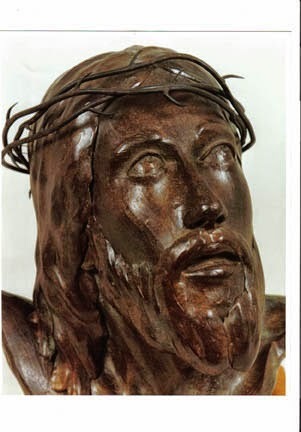 THE MANZI CRUCIFIX project is a long story, but one some will find very interesting. This will take a few posts, so I can reveal what happened, how I was chosen to design and create the piece, and all the magic occurrences throughout. 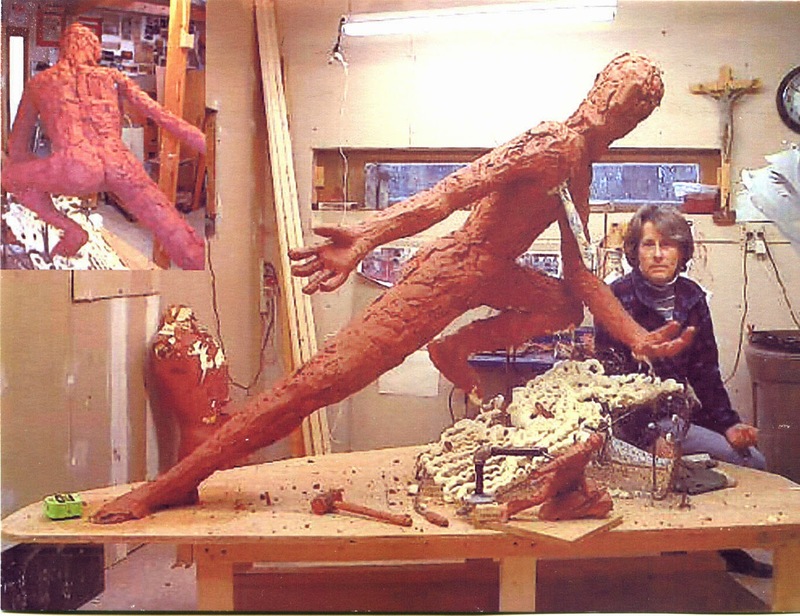 One of the most unusual things that happened was at Skidmore College in my evening figure sculpture class just as I got the commission in 1997. A woman in my class kept raising her hand as I went on about how very fortunate I had been to have been considered to do this piece. I went on, but finally called on her. She said, and I quote..."you might want to talk to my father." Well, this began a months long collaboration with Dr. Frederick Zugibe, one of the foremost experts on crucifixion in the world. And my student and friend Kathy Blaber's dad. Much more on this, and Dr. Zugibe's research, etc. which informed my work. Above you will see two photos that were taken after the piece was installed in St. Joseph's Church in Millstone, New Jersey. The Head was given as a Christmas gift that December from me. Christ's face, upturned and at this height (14 feet off the ground) was difficult to see. So I used the mold for the crucifix figure and cast a separate head for a side chapel. The #2 in the planned edition of 6 was purchased by St. John the Evangelist Church in West Chester, Ohio. #3 in the edition was to be the last, due to deterioration of the mold. #3 is currently available, and looking for a home. 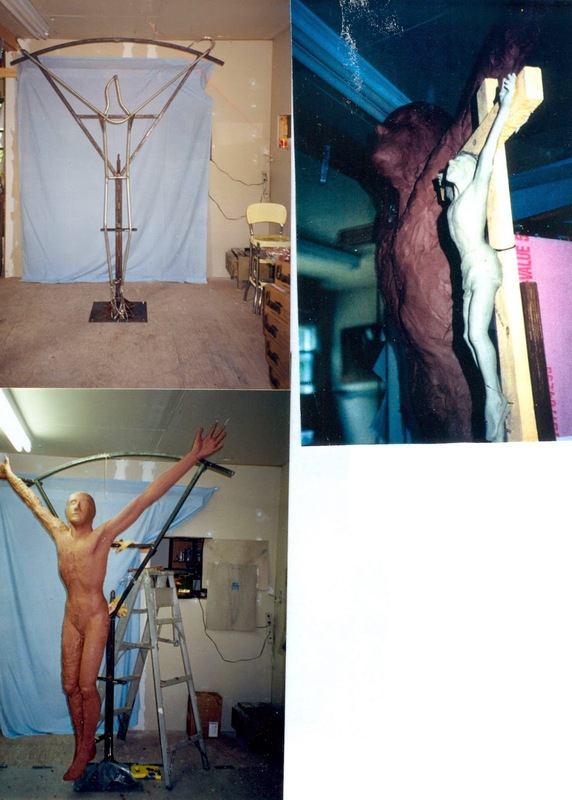 Much more on the Crucifix and many other of my sculptures in all media, coming soon. Every day is different! Enter to win a gorgeous glass sculpture made by yours truly! This beautiful piece is 6 inches tall, is made from fluted tubing and shines brightly with blue and gray accents from glass frit. Please share with friends! Winner will be announced! Just a quick post. 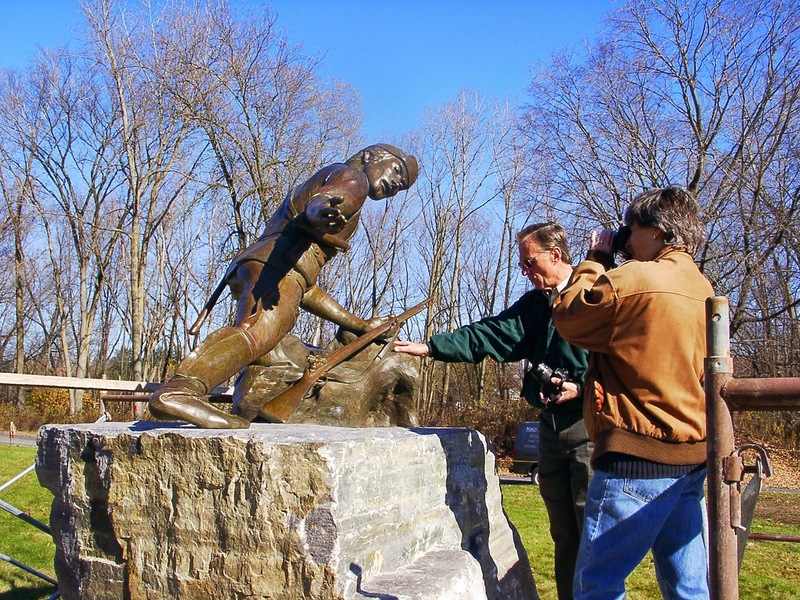 In going through some photos today of my statue for LAKE GEORGE STEAMBOAT COMPANY, found a few images. 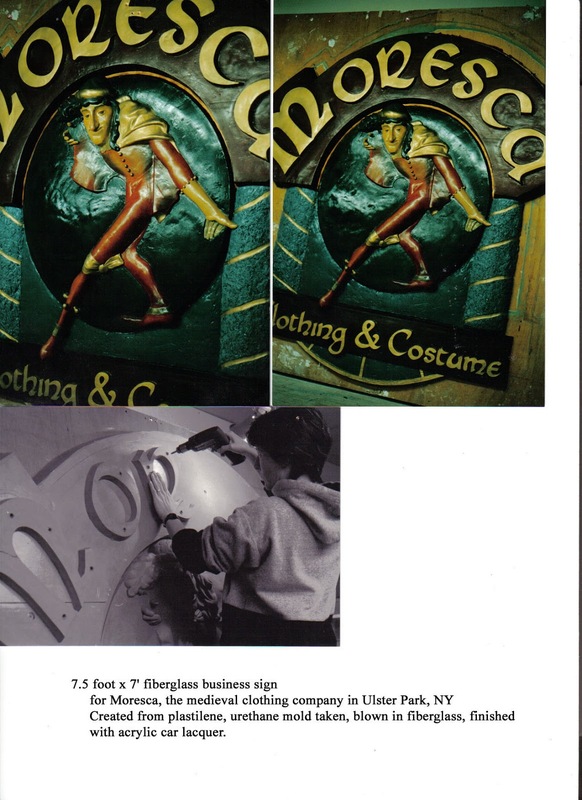 And it WAS a stretch for a classically trained sculptor to work in this style, creating head, arms and legs and then draping the wet fiberglass soaked with resin for costume! But fun! 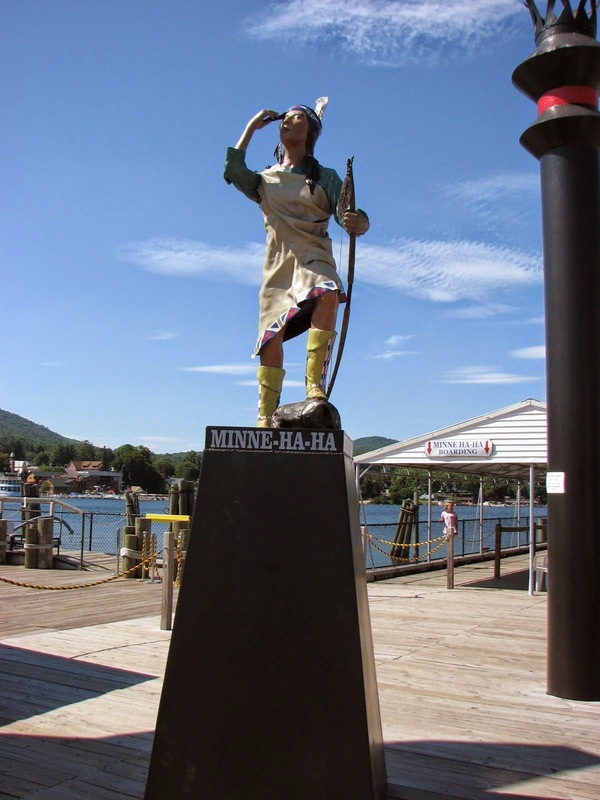 Minne Ha Ha will be back on her pedestal in the Spring to greet visitors to the steamboat bearing her name. Discovered in my research that although Hiawatha was a real person in history, the "Song of Hiawatha" poem by Longfellow, and also Minne herself, were fiction. I need to find out more on all this. 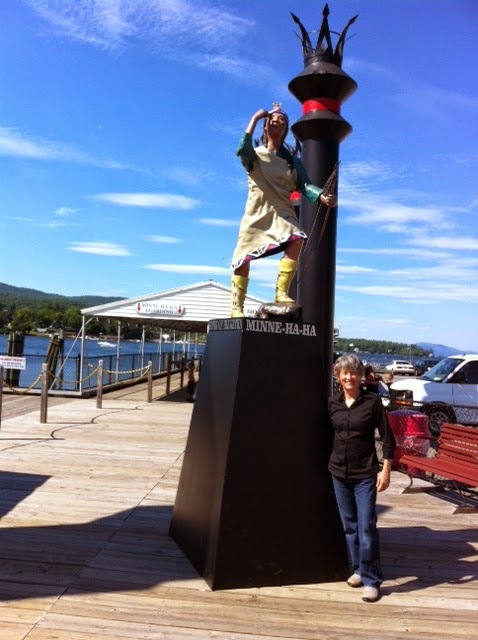 Planning on Facebooking that I will be at the dock on certain days this coming summer to take photos of visitors with their families and the sculpture. The folks at LGSC have said that Minne was an instant icon. When I went to photograph the piece I kept being asked to take pictures of people with their cameras. It is as if Minne was always there! Hope all will take the time to comment! 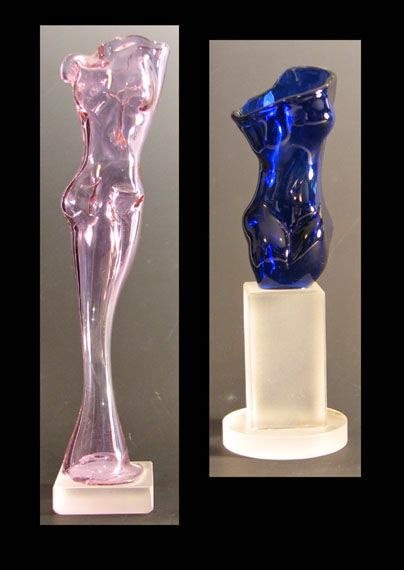 Also, see Alice Manzi Sculpture on Facebook to join a contest to win a glass sculpture! To finish up my combined posts about the Robert Rogers bronze statue creation, a couple of extra photos. Robert Rogers great great great nephew from Canada, who I used as a model for the face. Robert came all the way down from his home (dressed in the suit he had had made) to be there at the unveiling of the statue. 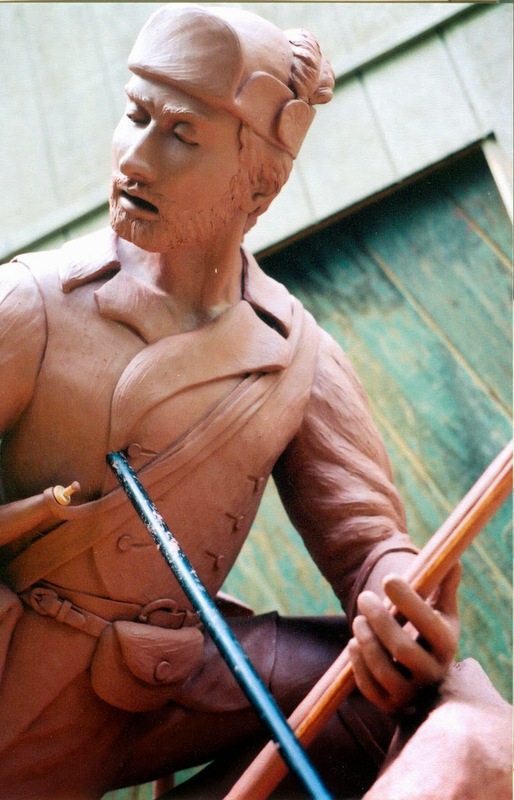 A small clay piece I was developing for the Army's use at the Ranger school. 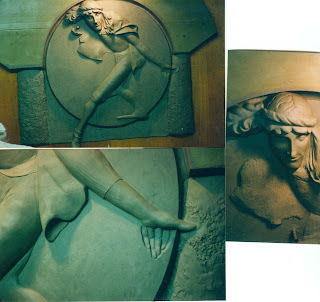 It is cast from the original mold of the maquette. The glaze is clay from Rogers Island. I hope visitors to this blog might ask me about this little project. Fascinating. A quiet moment with Janine Thomas, who was responsible for getting me the commission. So thankful for Janine! 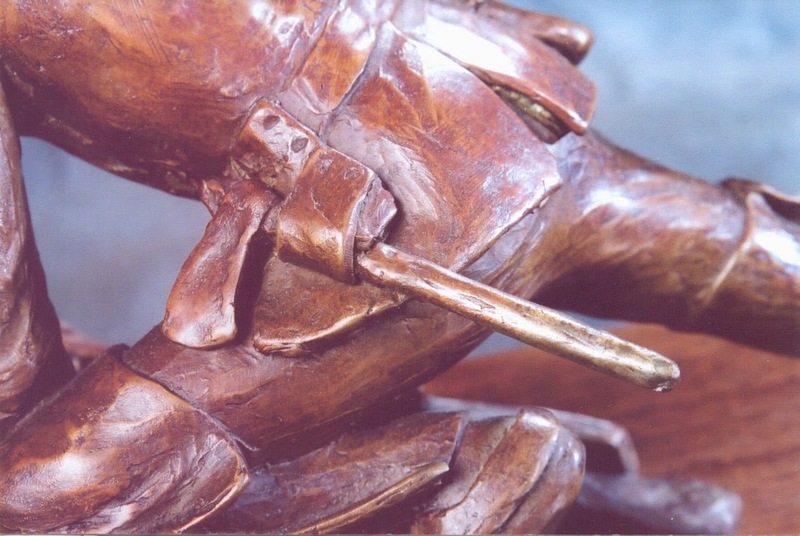 Detail of the bronze maquette. Just love this little piece at 11 inches in solid bronze. Mr. Nastasi had asked that we have a Sabrett's Hot Dog truck at the Island, and that he would give everyone lunch that day. Two weeks before I had been at a town wide event in Northville and had seen a Sabrett's truck.. This is not an everyday occurrence up here. I hired the owner and we had a great lunch, complete with Indians in total costume; loincloths and body make-up, standing in line for hot dogs. Missed that shot. Channel 10 was there, as were the local news outlets. A great day for all. More very soon. Do write and inquire about anything that interests you. So we left our hero in the wax at Polich/Tallix. After doing that work and returning home, I waited while the foundry began to process the individual pieces by coating the sections with a slurry of ceramic material, called a shell. This coating covered all surfaces, including all the gates and vents that had to be created in order to allow the bronze to flow in and the wax and air to flow out. A burnout process heats the shells to a temperature that makes them ready for the arduous task of accepting the molten bronze. I next visited the foundry when the time came to patina the piece. 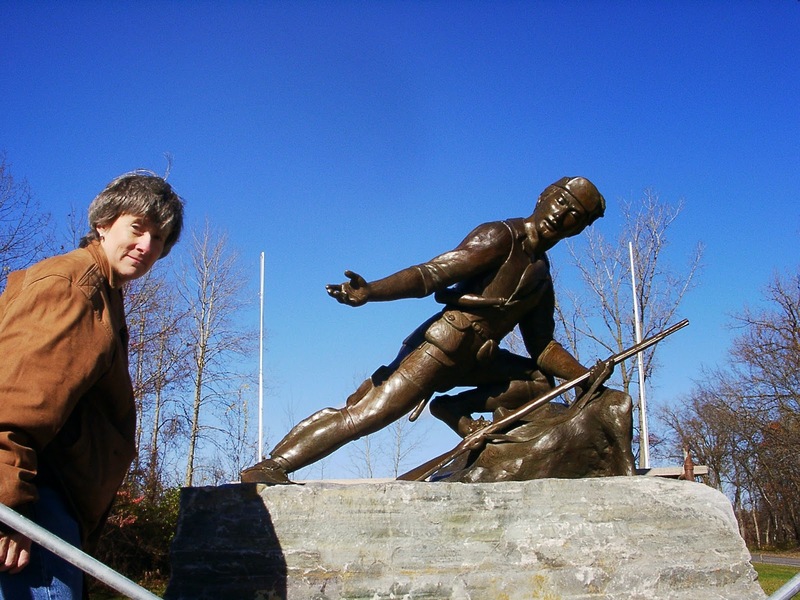 I knew what I wanted for this sculpture, and so a patineur was assigned to me and we made decisions as we went. A little brown with green highlights in the shadows only. Coats of wax were applied to protect the piece. We deeded not to use lacquer or similar material as sealer because of the aging of that material over time. Arrival of the piece at Rogers Island. Mason John Abrahamson did the work on the 7 ton stone. With my good friend the writer and sculptor Walter Lape. I miss him every day. 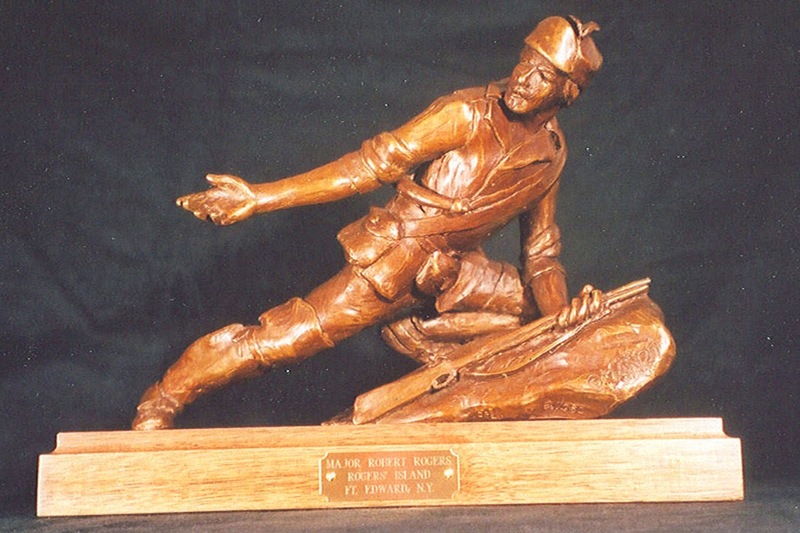 The maquette of the piece in bronze. I had one made for Frank Nastasi, who was pleased to get his Christmas present from me that year. A second copy is here in my home to remind me of the excitement of this very important project. A friend of Mr. Nastasi's called a few years back to say that since Frank had not in fact left him the model in his will, he would need to buy one himself. He did. 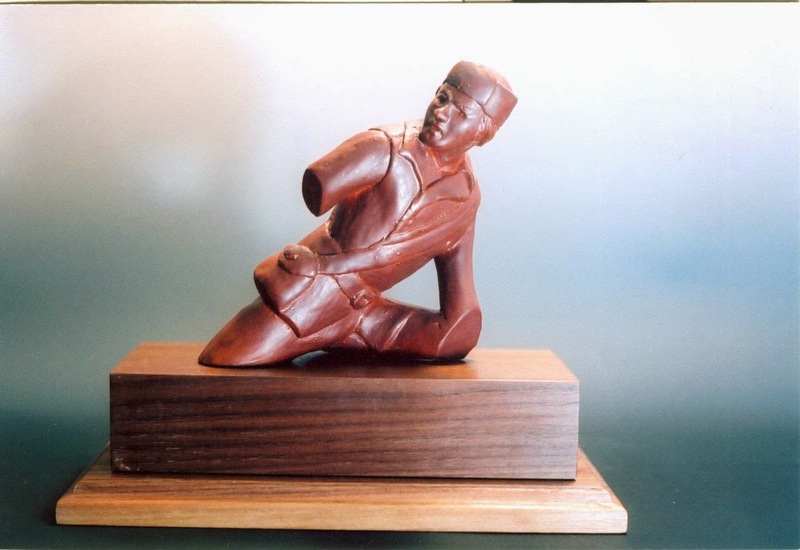 My friend and former Army Ranger Thomas Nichols is handling all sales of the maquette on his website at rangerring.com. Thomas' website is the official site for the purchase of US Army Ranger Rings and memorabilia. Here is a shot of the signature which I placed on the 'rock' Rogers kneels on. Again, in Chavant Clay- as the entire piece was. Since the client, Mr. Nastasi, was coming to review the piece in clay, I had to build a side porch as he was in a wheelchair and would not be able to enter the studio. 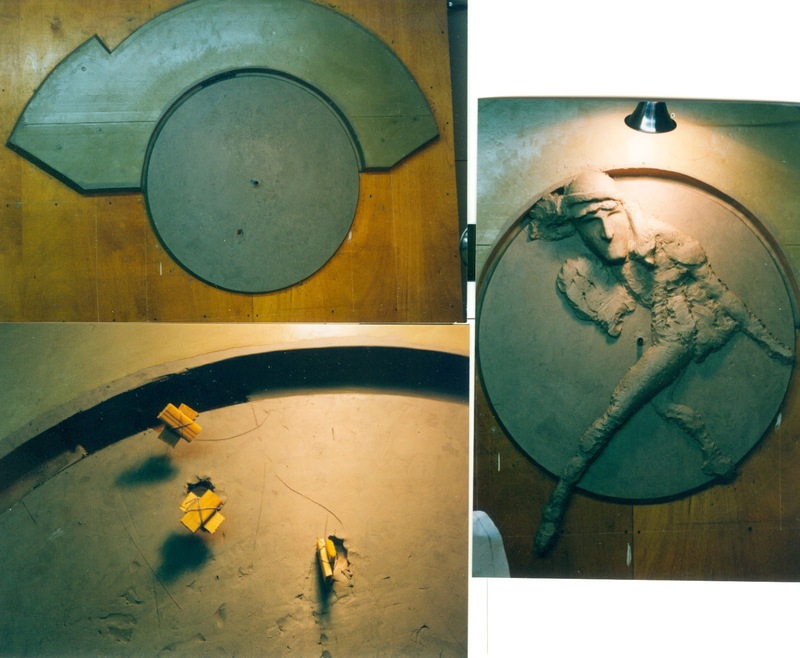 Here are a couple of photos of the clay original on the side porch at Manzi Studios in 2004. Rogers had 27 faces before I was satisfied with the look. One was with a beard, which the client immediately dismissed. Really? Did soldiers of the time in the woods truly shave each and every day? Not my choice, but I did like the final look. Now, as you will see, the arm was designed to be removed for molding. This often happens with large figurative work. He is supported by a post in his chest for strength while the work was being done. I decided that Polich/Tallix Foundry would do the mold, as I wanted them to have exactly what they wanted for the wax prep. Usually I do the mold, saving the client in budgeting. I decided after many years that I was no longer going to be carving marble, and therefore did not need the air compressor I had been storing in the house. I put it out in front of the house with a sign...FREE. Soon a truck with a crane pulled up and began to question me about the compressor. He would take it, but did I need anything done he could assist with? 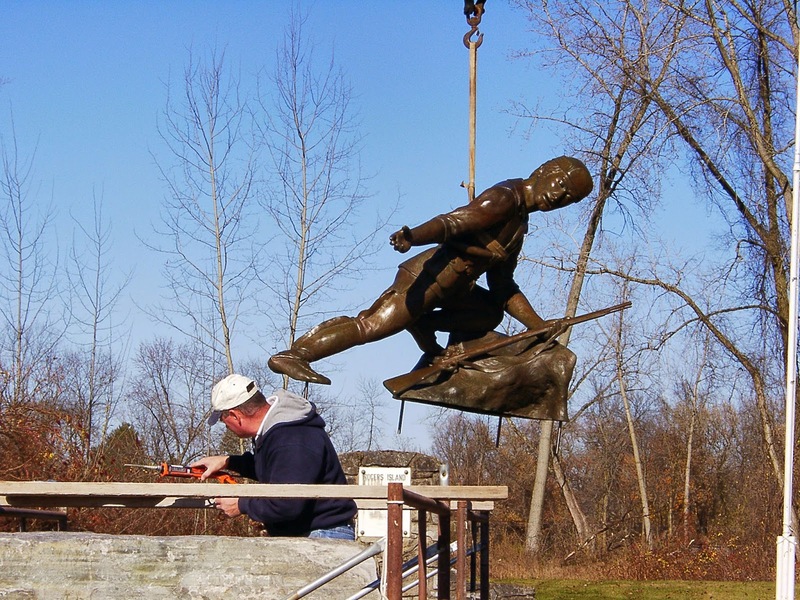 Well, as a matter of fact, I would when the bronze was finished, need transport to Rogers Island. DONE! The final face was informed by my finding the Great great (great, how many greats was that?) nephew of Robert Rogers in Canada. His wife took some face shots and I was able to get a great feeling for the structure he probably had. Is this synchronicity #4, I lose count. Here we are after rubber molding and casting in wax at Polich Tallix in Rock Tavern, NY So thrilled to be able to work with my friend Vanessa Hoheb and all the artists at Polich. I found the Major in pieces suspended from the ceiling. It was my job to 'touch him up'. So exciting. Someone please remind me to talk more about Vanessa and her dad, the sculptor Bruce Hoheb. Hello again to all who are following my new blog. I will try not to have so much time in between posts. 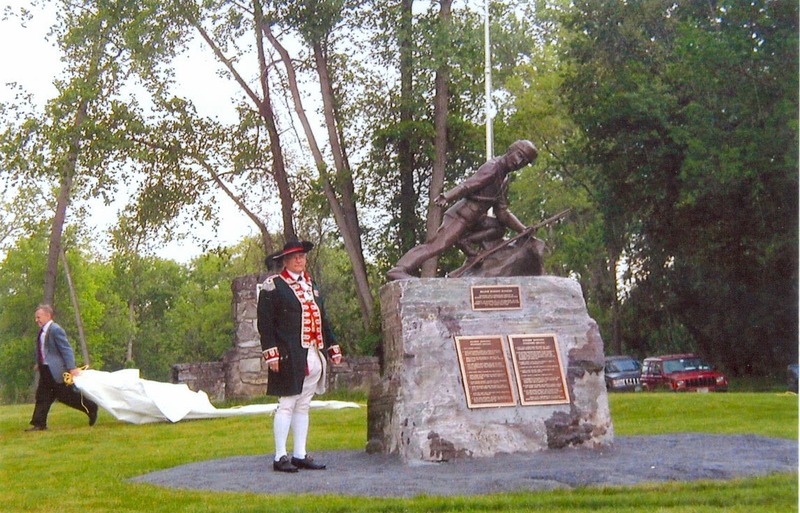 The following will be some posts about the design and creation of the Robert Rogers statue at Ft. Edward, NY. Too much info for one page, and so I will space it out, IF I remember how to do this. No guarantees! In every case I will try to give some info and pictures that have not been seen before, a "behind the scenes" approach. The small model was made of Chavant Clay, my clay of choice for everything I do. I refer to it with students as the Rolls Royce of plastilenes. It was later cast in an edition of 25 in bronze at Campbell Plaster and Iron in West Rutland, Vt.
My very good friend Janine Thomas was volunteering at the Hyde Collection, our world class Museum in Glen Falls. A man came in asking who he could reach to have a bronze statue made. Janine said, simply, "you will have to talk to Alice". That was the beginning of the project. Mr. Frank Nastasi, a Long Island businessman, had had a long time fascination with Robert Rogers, the French and Indian War hero who wrote the Rules of Ranging the Army Rangers still use today. Mr. Nastasi had purchased Rogers Island, just outside of Ft. Edward, where the Continental forces and the British had been stationed. His purpose was to create a historic site complete with statue and Museum, hotel and Marina. This is where it got interesting. I was at the time a member of the Upstate Independents Screenwriting group in Albany. One evening I was very taken with the appearance of a young man who had participated that night for the first time. I was looking for a model. He had long hair in a ponytail and was very muscular. Turned out he had been a Ranger, had been to the Ranger School in Georgia, and etc. he posed for me, crawling around the studio in the manner of the Rangers, moving to avoid detection. This is the kind of synchronicity you discover when you are doing what it is you should be doing. It continued. When the design in miniature was approved by the client work began on a welded steel armature. This was done at the shop of a good friend, Jim Moulton. Jim had followed me home one day when he saw the Manzi Van in Saratoga and wanted to meet me. Jim is a skilled engineer and metal and wood artisan in addition to his other talents. We made the skeletal structure together. Here you can see the outline of the body and the rock. Two views of the full size piece, planned to be 6 foot 4 inches. Spray foam was added to fill in the gaps of the armature. Then Chavant Clay was added by heating it in a microwave, and applying it with insulated gloves for speed. I soon began correspondence with those who had studied Rogers for years. They stuck with me, even sending drawings of how the tomahawk would have been shaped, and the like. More coming on this project, a very exciting one, and one that I can visit at any time! Hello to new and old friends! This new blog, hopefully, will introduce you to what I have been up to recently here at Manzi Studios. Lots to share, and I will be trying to give visitors a 'behind the scenes' look at what goes into the design and creation, not only of the big commissions, but of the small glass figures as well. Hestia was purchased by Ellen Harris of the Ellen Harris Gallery in Provincetown, MA. When years later Ellen passed away, her son offered to allow me to buy the piece back. I did. She is the only piece of mine I have bought back. Never wanted to let her go! And... on the same day as the previous post, I caught Nijinsky (who most have never seen) with an ice formation as well. Even bad weather can bring art! Hoping all who visit here might like and share with friends who are in the art business, professionals and aficionados. Happiest of New Years to all! 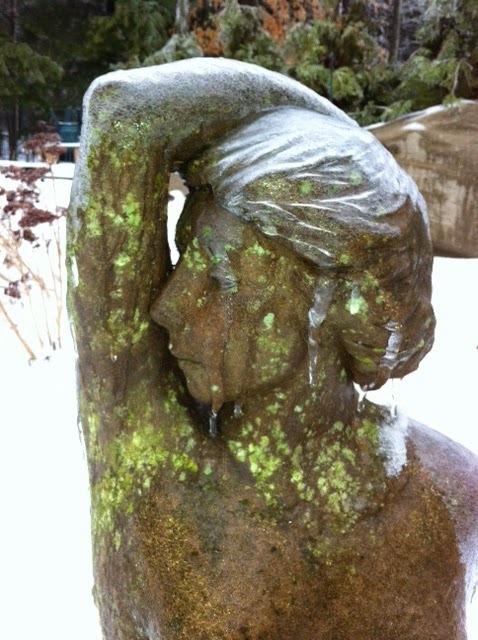 A little nasty weather gave me the opportunity to photograph Hera once again, covered with a sculpted sheet of ice. I think Hera, Goddess of Marriage, created in the 80's at Skidmore in Saratoga may become the ongoing visual of this new blog for 2015. She has many moods, and has recently been relocated to the berm behind the new house.